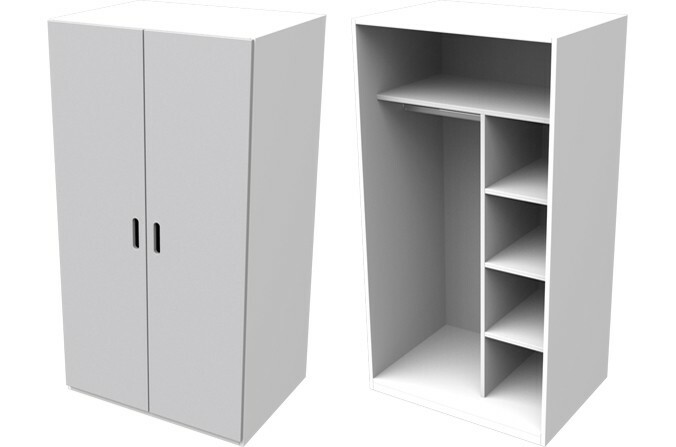 Kids Wardrobe - A white laminate wardrobe carcass and internal components with painted MDF doors finished in Elephant Grey to match all other items in the Cheyenne Collection. Featuring a large hanging space to the left side of the wardrobe, four pigeon hole shelves to the right, and a full width shelf above, this compact wardrobe can accommodate all your little one's clothing with ease. The painted doors can also be finished in Arctic White, Raspberry Pink & Stormy Blue.